I am back again to talk about our next step in the fertility process, honestly I didn't think it would be this soon. Since we started talking about the subject of fertility online, Joanne and myself have been inundated with suggestions and advice. They have been wide ranging, we have had every kind of suggestion you could think of, from seeing doctor X to healers to certain clinics and herbs. What we did decide to do was at least research and study anything anyone sent us. I would like to think that if people took the time out to get in contact with us the least we can do is really analyse what they are suggesting and see if it could suit our current situation. A lot of the proposed solutions were treading down already worn paths especially when it came to meeting with clinics or doctors who specialized in fertility. That for us was not going to be runner at least not at the moment, we believe that the whole clinic side and crazy fertility drugs need to be parked, no matter how old we might be getting. Everyone else is different and every situation is different but for us to stay away from the IVF drugs for now is the best approach for us both. There is also the other side to IVF , the money, we simply don't have any more money that we can spend on IVF treatment this year. This was me, beyond skeptical.. Throughout all the suggestions one thing kept popping up and in fact a woman got in touch with Joanne about it all. 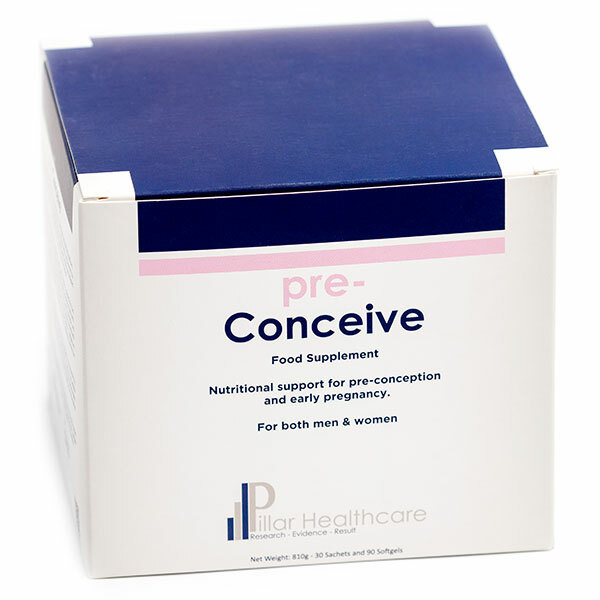 The suggestion was called Pre Conceive, it is an all natural mega supplement for want of a better word. The person who told us about Pre Conceive is a very happy user of the supplement and in no way was connected to the company that supplies Pre Conceive. She put us in touch with the main person at the company, a man by the name of Mark Whitney. Mark runs and operates Pillar Healthcare and founded the product Pre Conceive with Matt Ronan, they also work in conjunction with a nutritional expert by the name of Dr. David Smallbone. The first thing we did was arrange a call with Mark to see what we could learn about Pre Conceive. First off I have no problem saying this I was skeptical, I was beyond skeptical. The chat though swiftly changed my opinion, I thought Mark put simply would be like some sort of Snake Oil salesman. He wasn't... he was extremely knowledgeable, and an absolute gent to speak to, we nearly spoke for 1.5 hours. We told him our whole story and how we reached this juncture. He explained how he believed that this supplement of vitamins and minerals would improve our chances. One of the most interesting things is he did believe it would also improve my count. He said men with fertility issues can often suffer from a Zinc deficiency, so the first thing he asked is do I have white dots on my fingernails. I have always thought these were a calcium deficiency but not so apparently they can indicate your zinc is low. Zinc is what is needed for the sperm to break through the egg. Now I am not going to lie I am still skeptical but I do have a hope that it will improve our chances. Just look at what vitamins did for my sample by taking just e and c in high doses. He described taking one sachet is the equivalent of 1 full pack of normal over the counter fertility vitamins. What it aims to do is improve your fertility prospects through nutrition, all you need to do is take the drink once a day. He also explained their current plan was for a cross country clinical trial that will run in May of this year. He invited us to apply for the trial, this would involve a six month supply of Pre Concieve for us both and tests (eg. bloods and sperm samples). Naturally we applied straight away, no harm we thought. Mark suggested on the call that what he would like to do first is send us out a tester, so 15 sachets each to see if we could cope with it. I say cope he made the drink out to sound viciously horrible. We of course complied and were delighted to try it out. We literally had it two days later, I read some stories online about it so I can't say I wasn't nervous. I said to Joanne though I would take it first to see, first off ( Mark knows this ) the smell, Jesus the smell, its like soup mixed with sulphur. I added it to my glass of water, the sachet read "Tropical Fruit Flavour" and it was bright yellow. "Here we go" I thought it can't be as bad as Joanne pumping herself with drugs, but all the same I was ready to wretch. I knocked it back... it was totally fine! a bit gritty toward the end but not too bad, just smells really bad, so much so I have to drink it in the toilet now as I stunk the office out with it. Although if it works and we have kids, it could smell like manure for all I care..kidding.. kind of. Joanne took hers and we were off! we took it for 15 days finishing up yesterday. We had another very long call with Mark on Tuesday evening. He ran through our options suggesting we could wait for the trial but there is a possibility we might not get on it, because our fertility samples and bloods need to be within certain WHO parameters. The WHO are the World Health Organisation, they set the parameters and guidelines for all manner of medical disorders aswell Infertility. We thought you know what we will pay the money now and start the 6 month period of trying to make our bodies more nutritionally sound. The cost of Pre Conceive is a drop in the ocean in comparison to what we have paid for IVF treatment and if it somehow some way improves our chances without any IVF clinic heartache and or IVF drugs then we will naturally at least try this and hope. Even already we have noticed small but good changes happening, I have noticed a difference in the quality of my hair, skin and my nails do not have little white dots anymore. Mark says this is good as it means we are responding well. It is so refreshing for me to feel like I am helping properly this time around and not just on the sidelines. We start proper this Monday for 6 months so please wish us luck, every now again I will check in and let you know how we have been getting on. At the end of the day even if this does not work it will make us and our bodies healthier especially if we do go down the route of donor eggs next year. Before I finish up, here comes the technical bit, but also before I finish I must state this is not a paid for sponsorship or in any way do we have anything to do this with this company we are just two very hopeful fertility patients. I welcome all responses if you have done this before or if you know anyone who has done it please get in touch. Thank you so much for the post.I really glad to be here and very important information.Now days so many people fave this kind of problem and everyone always has lots of advice to couples going through infertility.Some people have awareness about this kind of treatment.